Discussion in 'Modding' started by Ronald Reagan, Dec 6, 2018. So Christmas holidays are almost here and it's that time of the year where I get the itch to do another build. I've been having this IBM Aptiva in my wardrobe for years now meaning to do something with it. Hoping to hear out some potential ideas since I'm way behind on modern hardware .. last build I did was a phase change X79 system and a water-cooled X58 system before that, pretty much stopped paying attention since. - CD/DVD drives have to be functional. I'd like to use the existing beige ones to keep with the colour scheme but they use IDE cables, any way to get around that if using a modern motherboard? - It needs a SFX psu but all the ones I can find are black..making it look out of place when looking at the computer from the back. Any industrial steel unpainted looking SFX psu around? 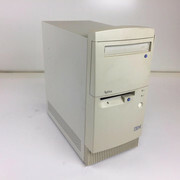 Wow, that was my 1st PC. Hardware wise I can't help you, but as for cooling, I think you can open up a decent sized hole under the front for more inlet air, which will be hidden. Good luck, look forward to seeing it evolve. Likewise I can't be of much help with most of the hardware, but for your ODD requirement, ebay will have IDE to sata adapters. Video/photo editing on a budget, probably look at AMD then. Anyways, good luck with the sleeper. Have a look in the retro arcade forum for some inspiration and you may be able to get some parts from there also.